Three years back, in a major beautification drive, the Bidhannagar civic board in Kolkata had installed statues of "legendary Bengalis" — the likes of Rabindranath Tagore and Ishwarchandra Vidyasagar — at prominent road intersections in Salt Lake City. 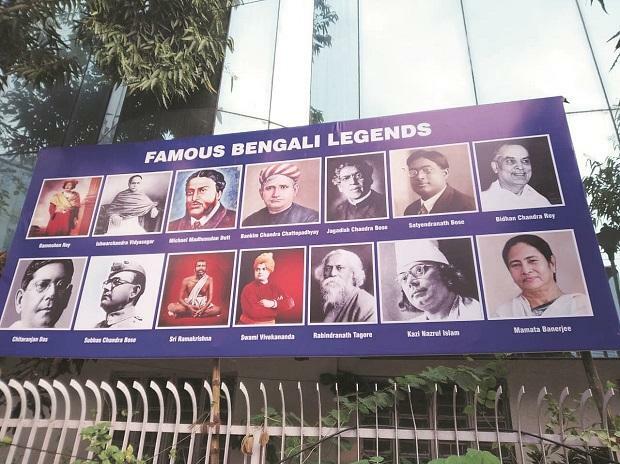 Now a billboard has popped up near College More in Bidhannagar that depicts pictures of "Famous Bengali Legends" including Rabindranath Tagore, Ishwarchandra Vidyasagar and state Chief Minister Mamata Banerjee. Skeptics are wondering if Banerjee's statue would also materialise in one of the many traffic islands in Bidhannagar one fine morning. Did someone mention Mayawati? With the Lok Sabha election drawing near, it is also the time for politicians to use all possible methods to influence the electorate, including releasing books either authored by them or a compilation of their speeches. On Friday, Finance Minister Arun Jaitley is scheduled to release Sabka Saath Sabka Vikas, a compilation of selected speeches of Prime Minister Narendra Modi, along with Union information and broadcasting minister Rajyvardhan Rathore. March 8 is International Women's Day and the Trinamool Congress has taken the opportunity to organise a discussion on their party chief and West Bengal Chief Minister Mamata Banerjee's new book India in Distress. Both the events are scheduled to be held in New Delhi. With the final list of candidates for the coming Lok Sabha election to be announced this week, both the Communist Party of India-Marxist led Left Democratic Front (LDF) and the Congress-led United Democratic Front (UDF) in Kerala are banking on experienced leaders including sitting members of Parliament and the state Assembly rather than experiment with new faces. The possible list of LDF, which will be announced officially on Friday, is expected to have around six sitting MPs and two to three sitting MLAs. The speculated list likely from the Congress, to be announced officially on Saturday, is expected to have names like Mullappally Ramachandran, V M Sudheeran and former chief minister Oommen Chandy. The Bharatiya Janata Party is also looking for experienced candidates and the wishlist, according to reports, includes bringing back Mizoram Governor Kummanam Rajasekharan to contest sitting MP Shashi Tharoor in Thiruvananthapuram.